Produktinformationen "Korean Made Easy for Beginners 1 (Buch+CD)"
Korean Made Easy for beginners is made for a self study purpose using a simple conversational method to teach you everything that you need to start speaking and understanding Korean. The book is designed to be completed in a short time and simple enough for anyone with no background in Korean. - Easy explanations on Korean designed after the origin of Hangeul. - Essential grammar taught simply and directly through visual presentations. - Extensive use of pictures and tables for clear understanding. - CD recordings of professional voice actors and comprehensive explanations help you master Korean pronunciation. 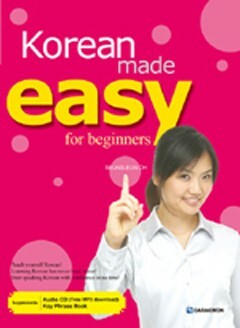 Weiterführende Links zu "Korean Made Easy for Beginners 1 (Buch+CD)"
Unser Kommentar zu "Korean Made Easy for Beginners 1 (Buch+CD)"
Kundenbewertungen für "Korean Made Easy for Beginners 1 (Buch+CD)"